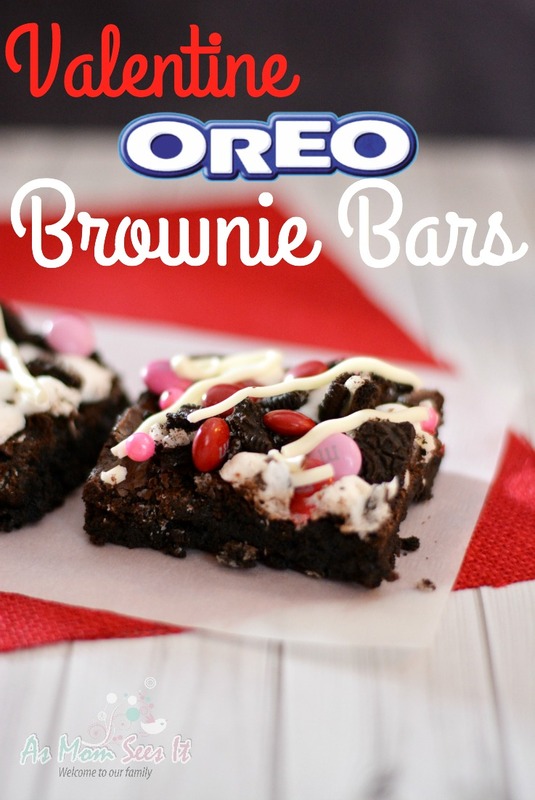 Would you rather share these, or hide in a dark corner with a spoon and these decadent Valentine Oreo Brownie Bars? We’re willing to share the recipe, but as for our chocolately treats? Hands off! 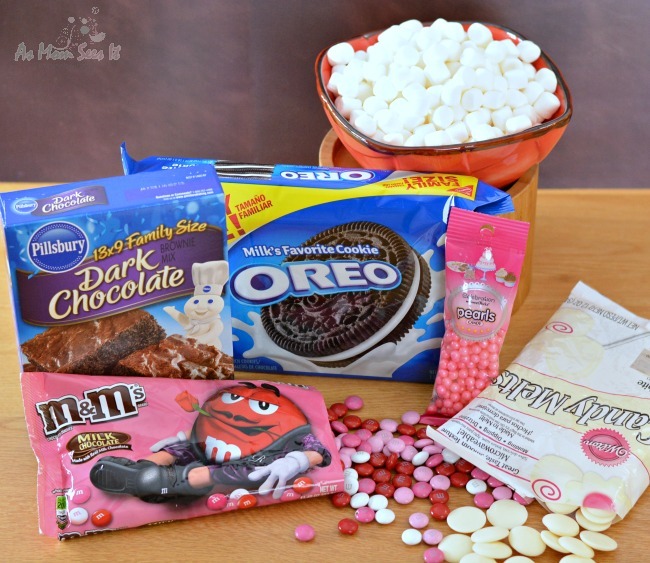 Their easy to make and perfect for a classroom treat, sweets for your sweet, or the perfect accompaniment to a night at home with your favorite romantic comedy and maybe a few a friends. Set aside 8 Oreo cookies and place 22 Oreo cookies in a thick plastic bag. Use a rolling pin or glass to coarsely crush the cookies. In another bag, crush the remaining 8 cookies into smaller pieces; these will be set aside for the top layer. Prepare and bake a package of brownie mix according to the instructions on the box. Pour batter into your pan and spread evenly. Bake for 25-28 minutes or until edges are firm. Remove from the oven and top with one and a half cups of mini marshmallows, evenly dispersing them over the top. Bake for an additional 1 to 2 minutes or until the marshmallows look puffy. Remove from the oven and place on a wire rack to cool. Sprinkle warm brownies with crushed Oreos, M&M candies, and pearls. Let cool completely. When brownies are cool, place candy melts in a bowl and microwave per instructions on the package. When melted, spoon into a Ziplock bag. Seal and snip the corner. Zig zag the melted chocolate across the brownies. Let cool and cut into 2″ bars. Makes 12 bars. A decadent and easy to make treat to share with your sweets or to enjoy by yourself during your favorite RomCom! Grease bottom and sides of 13x9 inch pan. Put 22 cookies in a plastic bag and seal. Use a rolling pin or drinking glass to coarsely crush the cookies. Set aside. Crush remaining 8 cookies into smaller pieces, for the top layer. Bake brownies as directed on package and stir in crushed cookies. Pour batter into your pan and spread evenly. Bake for 25-28 minutes or until edges are firm. Remove from oven and top with marshmallows. Bake an additional 1 to 2 minutes or until marshmallows are puffy. Remove from oven and place on a wire rack. 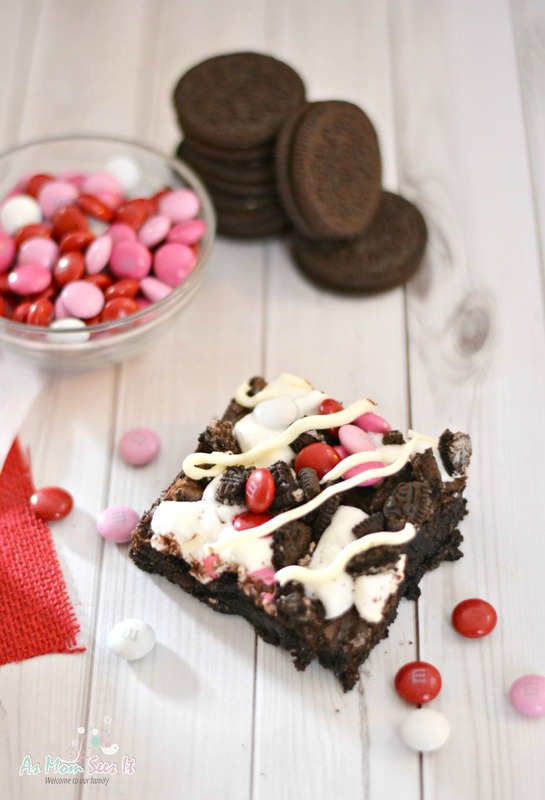 Sprinkle warm brownies with crushed oreos, m&m candies and pearls. Let cool completely. When brownies are cool, place candy melts in a bowl and microwave per package directions. When melted, spoon into the corner of a ziplock bag. Seal and snip the corner. Zig zag the melted chocolate across the brownies. Let cool and cut into 2" bars.